The fog may have lifted and the heavy rain eased, but moist northerlies are poised to return by early next week after a ridge of high pressure brings a period of settled weather to our shores. As the low moves away to the east it is replaced by a ridge of high pressure, which ensures that most places have a sunny end to the week. “However, the air over the country remains humid, meaning further muggy nights in the north, and areas of low cloud and fog morning and night,” added Little. As we head into the final weekend of daylight saving there is a mixture of fine and wet weather on the horizon. A front from the South Tasman Sea approaches the South Island on Saturday, bringing rain to Fiordland and South Westland. As the front moves up the South Island on Sunday the rain spreads further north, and scattered falls are expected east of the Alps. For the North Island, aside from some morning cloud in northern and western areas, predominantly fine weather is forecast on Saturday. This will please those competing in the IronMaori multi-sport event in Auckland, along with their supporters. 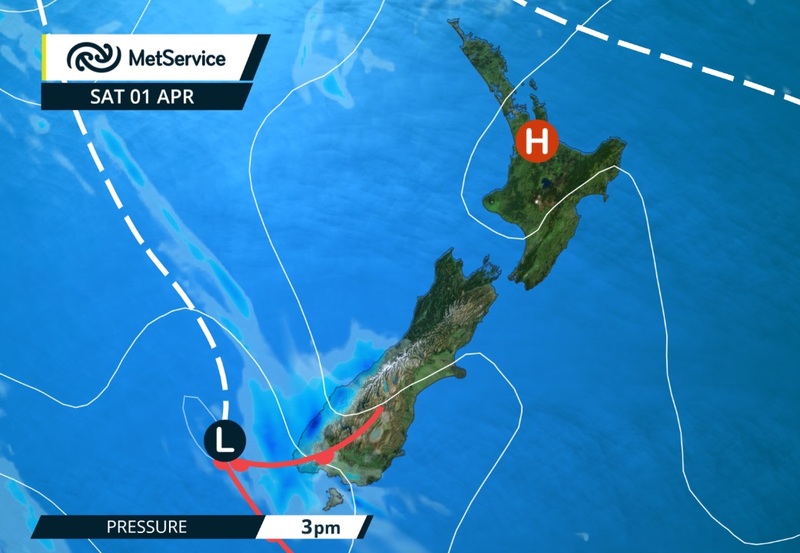 The weather remains fine in the east of the North Island on Sunday, but increasing moisture elsewhere brings mostly cloudy skies with patchy rain or drizzle.